Preheat oven to 325°. Season pork chops with salt and pepper. Rub baking pan with small wedge of fat from chops. Place chops in pan and bake for 1 hour until meat is tender and brown. Blend stuffing mix with butter, chopped prunes, chopped walnuts and orange juice. Fill 12 well greased small muffin cups with mixture. Top with either a pitted prune or walnut half. Cover with foil and bake during the last 20 to 25 minutes of the baking period. 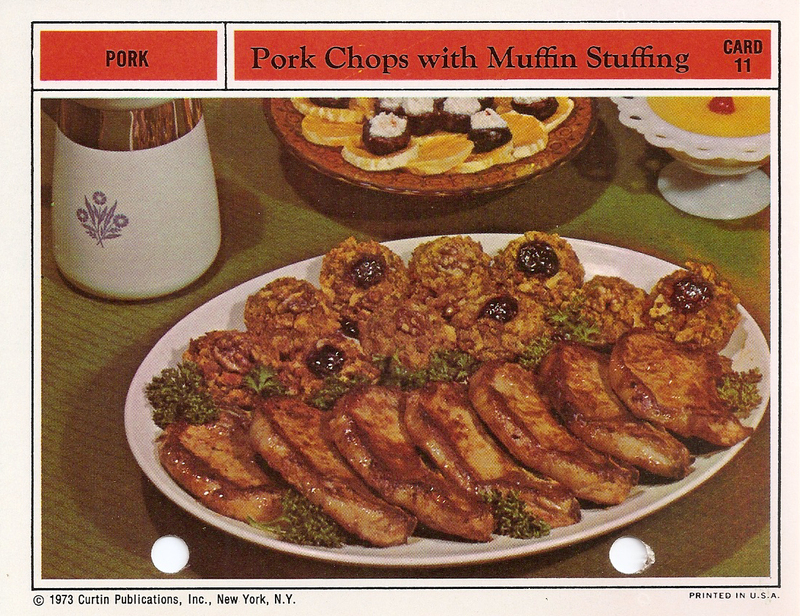 Arrange chops and muffins on a platter and serve. Preparation Time: 1 Hr. 19 Min. ©1973 Curtin Publications, Inc. New York, NY Printed in U.S.A. I made this and it was quite good! You might want to add a little garlic powder or other seasonings to the pork chops to add a little more flavor. The muffins fell apart when I removed them from the pan, but maybe they needed to cool a bit longer first. Very delish! Omigod omigod! I made this when I was in high school. We had those cards. I’ll never forget it. It was actually pretty good.